As a Welcome Bonus, new members have the opportunity to collect a 100% cash match bonus for their initial deposits, based upon minimum transfers of £10 and limited to £100 maximum. Thereafter, Sun Bingo offers numerous promotions to keep new players coming back again and again. It should come as no surprise that the online bingo hall operated by the U.K.’s favourite daily is a hit among players. 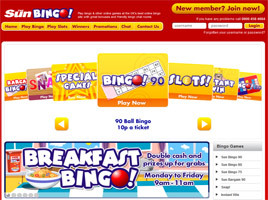 Sun Bingo started out in 2006 and quickly grew to become one of the world’s biggest bingo sites. Its games are powered by exclusive software from Gamesys, licensed and regulated in Gibraltar under arrangement through Entertaining Play Limited. English is the primary language used here, and the British Pound Sterling is the basic unit of currency. Resembling the newspaper’s own masthead, the web site’s distinctive red and yellow background is immediately recognisable. Sun Bingo’s format is functional, too, rating among the easiest bingo sites to navigate, with bold text and large buttons that make access to rooms and sides easy. High-quality audio paired with realistic animated graphics make playing enjoyable, and no downloads are required. The mainstay of Sun Bingo is Bingo 90, featuring some 21 rooms to play in, including a free-play room. Two rooms each are set aside for 75-ball and 80-ball bingo, and there are an additional five rooms for SNAP!—with ticket pricing set at 1p, 2p, 5p, and £1 and progressive jackpots ranging all the way up to £50,000. It is not unusual to encounter 50, 100, or even 200 players in the chat rooms. There are twenty, young and friendly Chat Hosts on hand to keep the roomies in line and the talk flowing, as they offer cash prizes to the winners of a broad variety of chat games, including Trivia, Boggle, and the ever-beloved Lunchtime/Late Headlines, which reward players who read The Sun. Eleven different slot games are available, too, with the cost of a pull starting at just 1p. One of the most popular slots is Mystic Meg, which offers a daily horoscope along with two exciting bonus rounds and payouts of up to 10,000X. Another favourite is Deal or No Deal, providing all of the excitement of the hit TV game show in a slot-machine format with three promising bonus rounds. Instant Win games are also featured on the Sun Bingo site. Prices start at 1p, 5p, and 10p for Whack-a-Moley, Gold Digger, Instant Wingo, Footballer’s Widow, and other themed games. Additional two-for-one games are played as part of BOGOF Mondays. There are additional complimentary sessions on Free Bingo Tuesdays. And Friday’s Link Ladder guarantees £1,000 or more in winnings as jackpots increase by £100 every hour between 4pm and 9:35pm. Monthly and seasonal promotions are constantly being introduced, such as Weekend Bingo, with BOGOF sessions held between 2pm and 4pm on Saturdays and Sundays. The £1,000 Guaranteed Full House at 9pm nightly doles out £7,000 a week. And 1p/2p Bingo gives everyone good reason to play, offering a lot for a little. Periodic competitions are also held to give away Mediterranean cruises to as many as eight lucky winners, with entries are made available in the Bingo Shop. As an ongoing feature of the web site, the Refer-a-Friend Bonus provides £10 in bonus cash for each new qualified referral received, up to a maximum of ten. Both the referring member and the new member get the cash reward.